A family-run business founded in 1989 by Volker Haas. Over the pasture decades HAAS has become a leading manufacturer of mobile machinery and complete installations able to produce high quality biomass, RDF and SRF from a wide range of waste products. The modern HAAS installations work solidly with low maintenance cost at a very competitive price. The use of sophisticated technology and well-proven concepts ensure success to enhance your business growth. HAAS offers a large production program for different tasks such as shredding, conveying, segregation, dosing, stocking and evacuation. Technological competence, effective engineering as well as an intensive development research and close collaboration with the customers are the main reasons for the success of HAAS installations and the basis for a long-lasting, successful collaboration with manufacturing companies and planning offices all over the world. 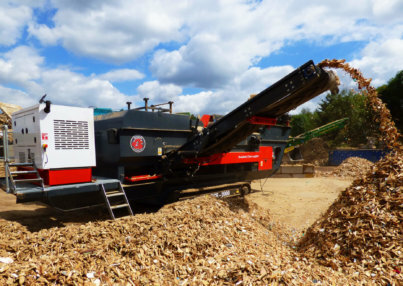 HAAS has installed complete installations for the waste wood recycling industry, the disposal of sawmill residual products as well as for the chipboard industry all over Germany. Furthermore HAAS has realised waste wood recycling installations in Austria, Switzerland, the Netherlands, Belgium, England, Russia, Italy, Spain, Slovakia, Canada, Africa as well as in Pakistan.